Last updated 25 June 2018 . By Russell Higham. Politicians, celebs and media darlings have been schmoozing over shepherd’s pie and other comfort-food classics at the original Ivy in London’s Covent Garden for over a century. Recently, under the banner of ‘The Ivy Collection’, they’ve copied and pasted their formula for success to a number of upmarket brasseries, cafés and restaurants at various locations in and out of the capital, the latest of which is a grand and very stylish former post office in the heart of Brighton’s iconic Lanes. Blending the gravitas of serious central London dining with the seaside sauciness of Brighton, The Ivy in the Lanes pulls off a great mix of the two, artfully combining classic with camp. Art deco diamond-patterned mirrors from the original restaurant are placed beside brightly coloured paintings of seagulls and crabs; murals of tropical plants and birds line the walls from which hang Fornasetti ‘Alice in Wonderland’-style portraits. It could all have ended up looking like an explosion in a paint factory but it actually works…and wonderfully well. A nice touch is the abundance of corner tables that let couples sit together facing the same way rather than opposite each other in the usual “interrogation” format. Cushions are strewn about everywhere, and in designs so varied and covetable you’ll want to stuff one under your top and shuffle out past the front desk pretending you've a “bun in the oven” just to get it back to your own sofa. Impeccable white-coated bartenders dispense sophisticated drinks at an elegant rectangular-shaped bar in the centre of the restaurant and it’s surrounded by high stools that offer excellent views of the eclectic mix of diners around you. It may have only opened a couple of weeks ago but this is clearly the city-by-the-sea’s new place to be seen eating or just quaffing a cocktail in. Bright and loud; The Ivy in the Lanes is making its mark in Brighton. The Ivy has always been about doing familiar food reliably well and with good quality ingredients (what you’d imagine school dinners to be like at a very posh and expensive private school!) so no point looking for cutting edge cuisine or molecular gastronomy here. Think good old fashioned British favourites for starters, like their giant pink and plump Prawn Cocktail (£9.75) or Seasonal Soup (£5.50) — in this case a heartwarming tomato with ricotta, courgette and orzo pasta. The Asparagus with Truffle Hollandaise (£7.95) came with the rich lemon-yellow sauce served at room temperature, just as it should be, and the truffle not at all overpowering the delicate flavour of the spring vegetable. The main courses of Crab Linguini (£15.95), with chilli flakes and garlic oil thoughtfully left on the side so that they can be added according to personal taste, and Steak Tartare (£19.50) were perfect specimens that simply could not be faulted in any way. A neighbouring table’s Fish & Chips (£14.50) looked far bigger and more succulent than anything you’d find on Brighton seafront, and at that price was much better value. In fact, what is surprising is just how low the prices were at The Ivy in The Lanes. From the cocktails (mine’s an Orchard G&T (£8.75) with RinQuinQuin a la peche and Creole bitters, if you’re asking) through to their signature dessert of Chocolate Bombe (£8.50) that implodes pleasingly as the waiter pours hot salted caramel sauce over it, everything on the menu appeared to be about the same cost as you’d find in a branch of somewhere like Jamie’s or Strada. Given the glitz of the surroundings and general panache of the place, I know where I’d much rather spend my hard-earned! 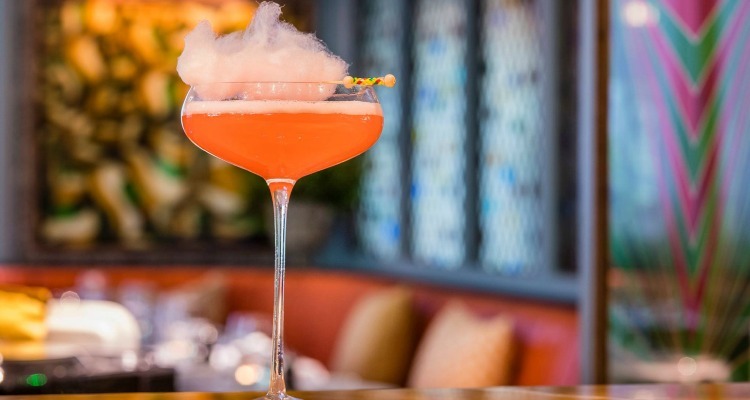 It's not just comfort food; The Ivy in the Lanes has a swish list of cocktails. 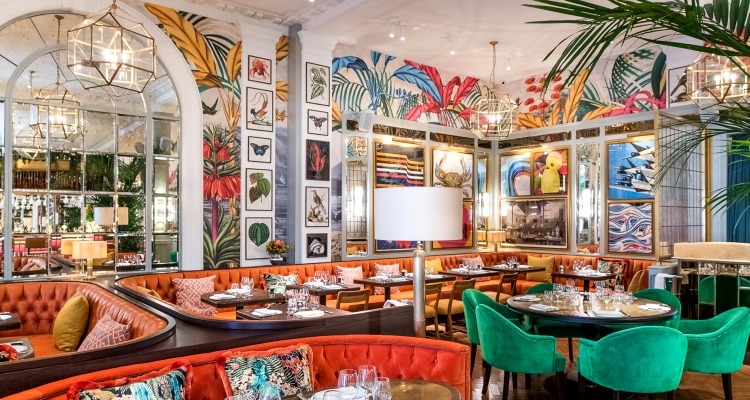 Pretty much perfect for any occasion — dinner dates, girlie brunches or afternoon tea (from £7.95) or even a decadent Champagne breakfast — The Ivy in The Lanes is definitely a worthy addition to Brighton’s already buzzing restaurant scene. Its quirky yet tasteful decor and high standard of service also make it a destination in its own right, well deserving of a trip to the seaside this summer. Just leave the bucket and spade at home.